We are still at Murramarang Resort and have settled in, what seems like, for good. We have extended our stay twice, mainly because of the school holidays, but there is everything we want here. The weather has been wonderful, with temperatures in the twenties and almost thirty yesterday. Some days we have just stayed around camp, others, we have taken out BBQs for lunch, although fires are not allowed. We have a gas stove, which has saved the day many times, as there often isn’t any gas bbqs or tables provided in most of the places we have been. One memorable lunch was at Depot Beach, 12 kms north and 8kms east in from the highway. The drive in was spectacular, as was the beach. 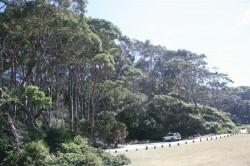 These were photos taken at Depot Beach, looking North, showing the Littoral Forest and our picnic area. This is Depot Beach, looking South – shame the water temperature is only 16 degrees! Throughout the footy season, Russ & I have a footy selection contest and the winner has to take the looser out for lunch – a win-win situation!! Russ took is winnings and shouted me a delicious seafood platter (for 2) at the Starfish Cafe, in Bateman’s Bay. Flathead, calamari, oysters, prawns and the best smoked salmon we’ve ever tasted. Yesterday was a bit of a worry, with a fire in the forest on the left side of the only road into our camp. We were told that things were under control and an expected wind change would take it away from the camp, but billowing brown and white smoke made it rather unnerving. Woke this morning to no smoke, but we were surprised to see, when travelling into town, just how close it was to the road and the resort. 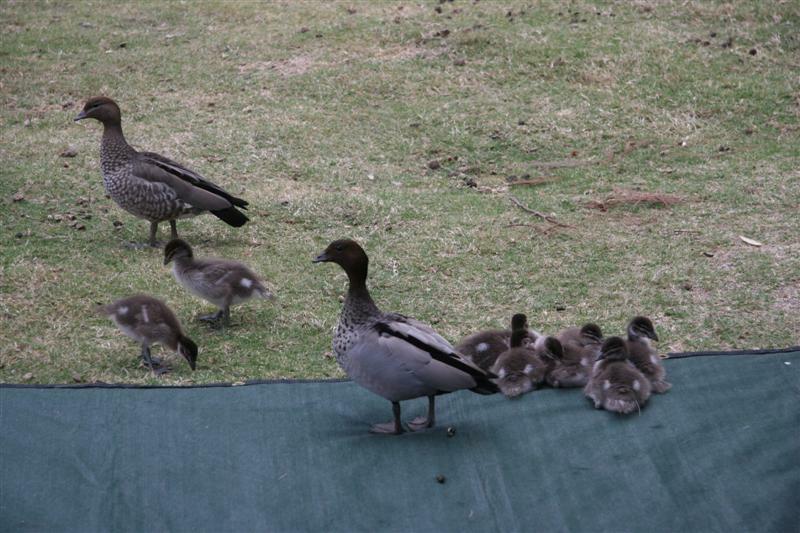 There is a lovely family of ducks – eight ducklings and two very protective parents, who seem to find our camp the safest place to have a nap. 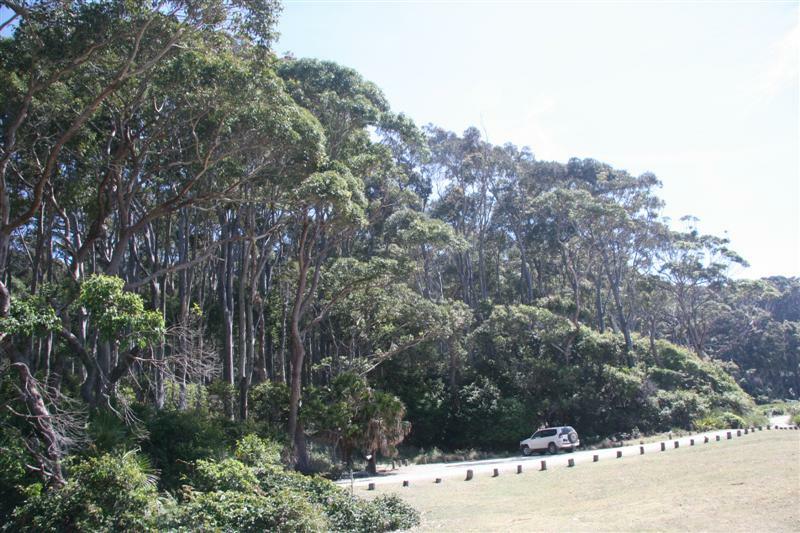 We are moving to Congo in the Eurobodalla National Park on Monday. Rain is expected, but it’s time to enjoy new surroundings. 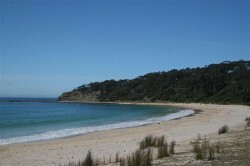 Glad to hear your Murramurang experience has improved. It’s a nice park and one that Jules & I took Maddie and Taylor to when they were little. 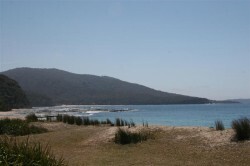 I have fond memories of catching my first gummy shark on the beach right out the front there. Really pleased you’re winding down and enjoying this trip. Enjoy what lays ahead over the next few weeks. Only 3 weeks till Mt Beauty! Yay for those of us still working who are looking forward to a break.